Philip Lee and Cally Trench visited Dan Lovelace's studio in High Wycombe on Saturday 31st July, where Dan showed them some of his recent work, including videos and the joint painting that he and Frances Greenough are working on together. 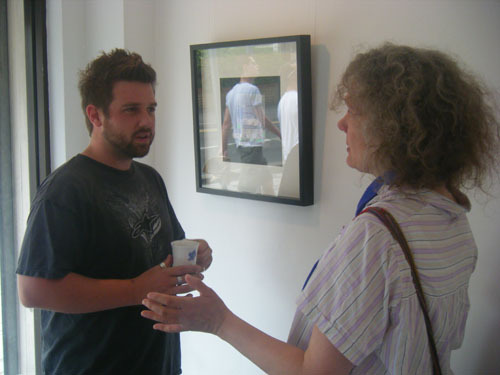 They also visited the Lucy Landers Fine Art Gallery to see an exhibition curated by Dan: When People Aren't Looking, showing work by Frances Greenough, Duncan Sellar, Michael Iveson and Dan Lovelace. 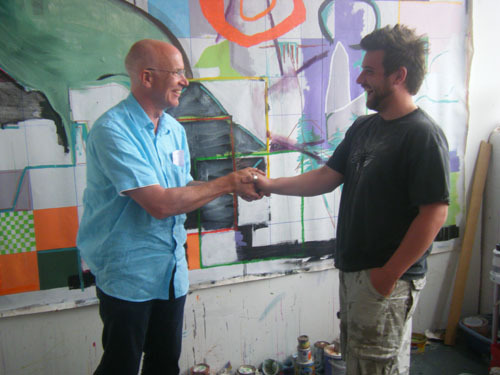 Cally Trench writes: It was great to see Dan's work, both as an artist and a curator, and to see the joint painting that he and Frances have started - a courageous and challenging project involving a huge canvas, lots of paint and two egos. Dan Lovelace writes: Yesterday for me was a good opportunity to get the feeling of an 'in' into the Remarkable and Curious Conversations project and I am now feeling like the process of engagement with the project has really begun. It was also great to get some feedback on some of my work, especially the videos as it is so new for me, really helpfu.